A solid employment contracts will clearly set out the rights and obligations between Employer and Employee. However a well drafted employment contract will do much more than that. It will help protect you as an employer against disloyal employees. For instance, confidential information is generally very valuable, as is your customer base. You want to do everything you can as a prudent employer to prevent that information from one day walking out the door to a competitor. There are other things that are delineated in an employment contract such as employee behaviour at work, restraint of trade if they leave and, where applicable, KPI’s. Employment contracts have the added effect of making you look organised and professional as an employer. A well drafted employment contract demonstrates that you value the employment relationship. Most employees feel comfortable also knowing the expectations and parameters of the role. This creates a great deal of confidence in the employee, which only helps your business. In a modern and competitive marketplace, employment contracts have become a fundamental. 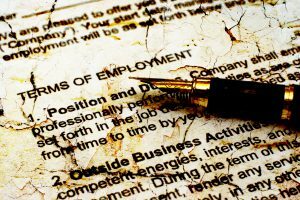 Our employment lawyers are experienced in drafting tailored employment contracts across a broad range of industries. We are experienced in acting for employers in unfair dismissal cases, Fair Work Commission matters and other circumstances where there is a dispute. We are particularly experienced in pursuing former employees for breaches of the employment contract, including wrongful use of confidential information and breaching restraint of trade clauses. As an employer, it is important to safeguard your business. Contact us today on 1300 907 335 or complete the form on this page to find out how we can assist your business and it’s employment matters.